The overall numbers are likely to be slightly below-normal this year in terms of the number of tropical storms and hurricanes in the Atlantic Basin (includes the Caribbean Sea and Gulf of Mexico) with around 11 named tropical systems, 5 hurricanes and 2 majors. In a normal Atlantic Basin tropical season, there are about 12 named storms with 6 reaching hurricane status and 3 actually reaching major status (i.e., category 3, 4 or 5 on the Saffir-Simpson Hurricane Wind Scale). The major factors involved with this year’s tropical outlook include the likely continuation of El Nino in the equatorial Pacific Ocean. In addition, the Atlantic Ocean is sending mixed signals in terms of the prospects for tropical activity this season with some sections featuring (unfavorable) colder-than-normal sea surface temperatures and others featuring (favorable) warmer-than-normal waters. The sea surface temperature pattern in the Caribbean Sea, Gulf of Mexico and western Atlantic Ocean (i.e., warmer-than-normal) makes the southern and eastern US somewhat vulnerable to what I call “home-grown” tropical hits during this upcoming tropical season. Listing of names to be used during this upcoming Atlantic Basin tropical season, especially like the fourth name on the list. Last year's tropical season was the third in a consecutive series of above-average with 15 tropical storms, 8 hurricanes and 2 majors. For the fourth consecutive year, activity began early, with the formation of Tropical Storm Alberto on May 25. The 2018 Atlantic tropical season may be long remembered for two damaging storms: Florence and Michael which took place within a month of each other. Hurricane Florence formed on August 31, and became the first major hurricane of the season on September 5, just one day later than the average of September 4. Florence made landfall in North Carolina on September 14, becoming the wettest tropical cyclone on record there and in neighboring South Carolina. Activity picked up once again in October, with Michael forming on October 7 and strengthening into a major hurricane over the Gulf of Mexico, before making landfall in the Florida Panhandle at peak intensity, on October 10. In 2017, seven named storms impacted the U.S. coast, including Puerto Rico, most notably hurricanes Harvey, Irma and Maria which battered Texas, Florida and Puerto Rico, respectively. In 2016, five named storms impacted the Southeast U.S. coast. The most notable was Hurricane Matthew with its powerful scraping of the coast and subsequent inland rainfall flooding. 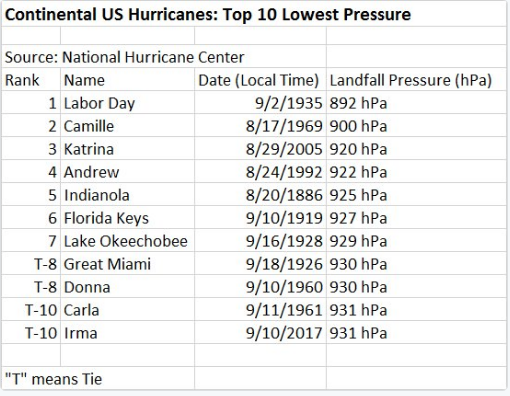 In the past three seasons, eight hurricanes were so destructive and/or deadly their names were retired from further use by the World Meteorological Organization. Before then, the number of U.S. landfalls had been well below average over the previous 10 years. What goes on in the tropical Pacific Ocean does indeed have an effect on the tropical Atlantic Ocean. El Nino, which refers to warmer-than-normal waters in the equatorial Pacific Ocean, affects global weather patterns and it tends to be an inhibiting factor for tropical storm formation or intensification in the Atlantic Basin. First, El Nino tends to produce faster-than-usual high-altitude winds over the tropical Atlantic Ocean and this increase in wind shear (change of wind speed with height) is hostile to the development of and maintenance of tropical storms. In addition, El Nino tends to result in sinking motion over parts of the Atlantic Basin which too is hostile to tropical storms. Weak El Nino conditions took hold in the equatorial Pacific Ocean during this past winter season and may be gathering some strength as upper ocean heat content for March was among the highest in the past 40 years averaging around 1.4 deg C above normal for the month. This is the third highest level for the month of March since 1979 and only trails March of 2014 and 2015 in terms of anomalous equatorial upper ocean heat content (source: Dr. Philip Klotzback, CSU). Signs point to its continuation of El Nino conditions through the upcoming summer tropical season and perhaps even through the fall. Numerous computer forecast models maintain the El Nino in the tropical Pacific through the summer and fall seasons at moderate strength. Not only are equatorial Pacific Ocean sea surface temperature anomalies important in terms of potential tropical activity in the Atlantic Basin in a given season, but Atlantic Oceans water temperatures can have a major impact on atmospheric circulation and, in fact, more of a direct role in the likelihood for formation and intensification of tropical storms. Sea surface temperatures of >80°F are generally considered a requirement for the formation of tropical storms; therefore, above-normal sea surface temperatures are typically quite favorable for tropical storm formation and intensification as tropical waves trek westward in the trade winds from Africa’s west coast to the western Atlantic Ocean. Indeed, the main breeding grounds for Atlantic Ocean tropical systems are in this region between the west coast of Africa and the western Atlantic Ocean and there are currently mixed signals in terms of sea surface temperature anomalies along this route. In recent weeks, there has been a persistent pocket of colder-than-normal sea surface temperatures in the eastern Atlantic Ocean near the west coast of Africa and this would tend to inhibit the formation of tropical storms in that important region. On the other hand, current water temperatures are generally above-normal in much of the Caribbean Sea, Gulf of Mexico and the western Atlantic Ocean and they have been so for many months. These anomalous warm regions should aid in the development and intensification of tropical systems; especially, with respect to the “home-grown” type of system that can form relatively close to the US east and Gulf coasts. As far as the Mid-Atlantic region is concerned for the upcoming summer season, I believe it is likely to turn out to be wetter-than-normal and warmer-than-normal, but not an excessively hot year. Specifically, in terms of temperature anomalies, I expect the summer season will average out from 1.0-3.0 degrees (F) above normal in the Mid-Atlantic region and humidity levels will be rather high overall resulting in many uncomfortable nights. One important factor that should inhibit the chances for an excessively hot summer is the fact that soil moisture is quite high around here thanks to a long-running rainy pattern and also a relatively cold beginning to spring which has limited evaporation in the top layers of the surface. Given the current and long-standing wet soil conditions, it is likely that a portion of the sun’s energy this summer will be “used up” in the evaporation of soil moisture rather than in the heating of the ground and lower atmosphere.